Change is in the wind. The Round Table is heading to Chickamauga for a two-day, one-night tour of the Chickamauga-Chattanooga NMP. A busy fall schedule has limited the availability of guides to the originally planned tour of the Dalton-Resaca (GA) sites and battlefields and has led to this change for the Round Table. Program Director Richard Smith has come up with a very viable alternative, a tour of Chickamauga, every bit as worthy of your participation as the previously planned excursion. Smith, in quick order, has developed the substitute tour hosted in part by Round Table favorite Park Historian Jim Ogden, and the dates are set for October 28 & 29. 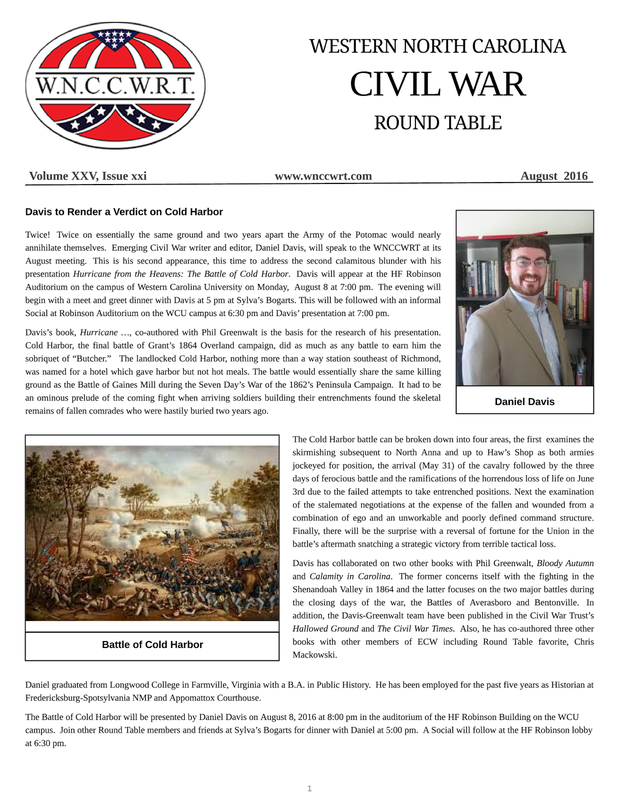 Further details are available in September newsletter or by contacting Richard Smith, 828-293-5924.